← Did the Wizard cheat the Scarecrow? Unfortunately, x is not 10 degrees. Sorry. It isn’t 10 degrees. Sorry. X=#### degrees n I’m a grade 10 learner am I correct? You are correct! I changed your comment to remove the correct answer so others won’t know what it is. Nicely done! Unfortunately, you are also incorrect. Sorry. Is it 60 degrees. ^)^)^)^)^)^)^)^)^)^)^)^)^)^)^)^)^)^)^). Sorry I believe there might be an inconsistency here. If angle A and angle B are each 80 degrees, C must be 40 degrees. This means that in triangle ACE, angle E must be 130 degrees. Now, if you were to solve for E a different way: If you solve for the bottom triangle, you would have one angle 70 degrees and 80 degrees (given), and the remaining angle must be 50 degrees. Using supplementary angle law, we know that the two angles next to it must be 130 degrees. Using this, we solve triangle BEX(X is the middle point with the 50 degree and 130 degree angle), we find that E is equal to 30 degrees. 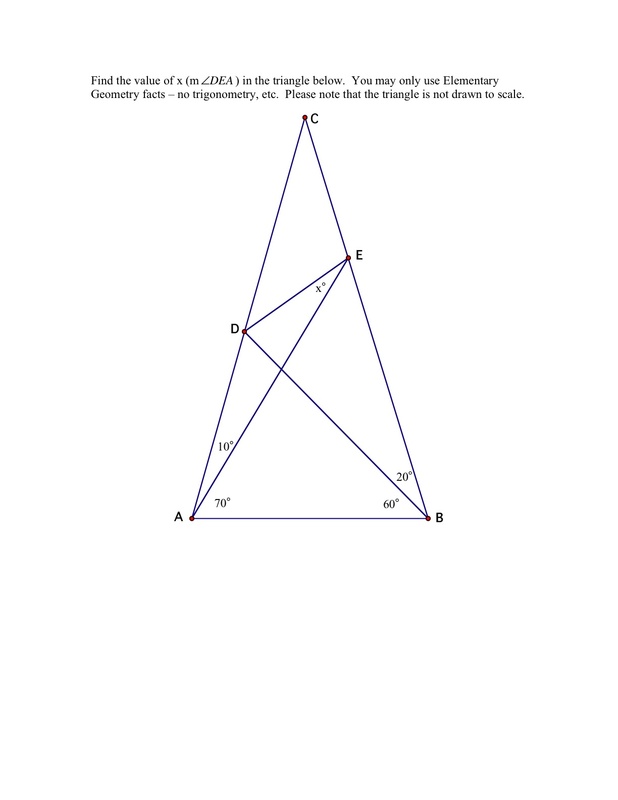 Using supplementary angle, we find that angle E in triangle ACE must also be 150 degrees (180 – 30 degrees). This means that E is equal to either 150 degrees or 130, which is an inconsistency. I checked my math so I think that is the case, but if it isn’t, can you please let me know? The issue with the problem is that it is not drawn to scale. The diagram is intentionally misleading. As such, there are certain results that will appear correct until the diagram is drawn to scale. I hope this helps a little bit. Unfortunately, you are incorrect. Sorry. You are correct! I deleted your answer from your comment so others would not know the answer. You are correct! I removed your answer so others wouldn’t know the answer. I am sorry but that is incorrect. Don’t give up! Unfortunately, that is incorrect. But keep trying! Unfortunately, you are incorrect. Try again. You are correct. I removed your answer from the post so others wouldn’t know what the answer is.